Explanation: How does wind affect sand on Mars? To help find out if it differs significantly from Earth, the robotic Curiosity rover on Mars was directed to investigate the dark Namib Dune in the Bagnold Dune Field in Gale Crater. Namib is the first active sand dune investigated up close outside of planet Earth. 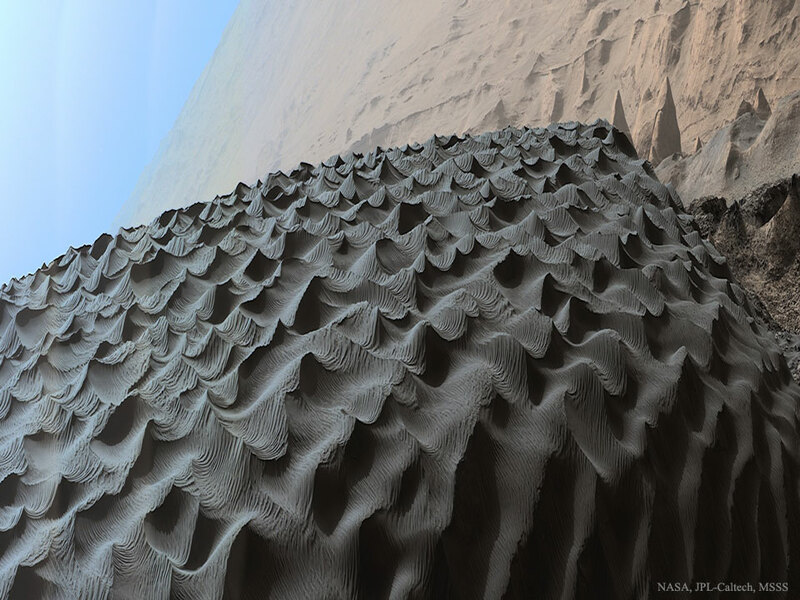 Wind-created ripples on Earth-bound sand dunes appear similar to ripples on Mars, with one exception. The larger peaks visible on dark Namib dune, averaging about 3 metres apart, are of a type seen only underwater on Earth. They appear to arise on Mars because of the way the thin Martian wind drags dark sand particles. The featured image was taken last December and is horizontally compressed to show context. In the distance, a normal dusty Martian landscape slopes up in light orange, while a rock-strewn landscape is visible on the far right. Curiosity unexpectedly went into safe mode in early July, but it was brought out last week and has now resumed exploring the once lake-filled interior of Gale Crater for further signs that it was once habitable by microbial life. 40th Anniversary: Viking 1 on Mars.